Product prices and availability are accurate as of 2019-04-16 18:55:08 EDT and are subject to change. Any price and availability information displayed on http://www.amazon.com/ at the time of purchase will apply to the purchase of this product. 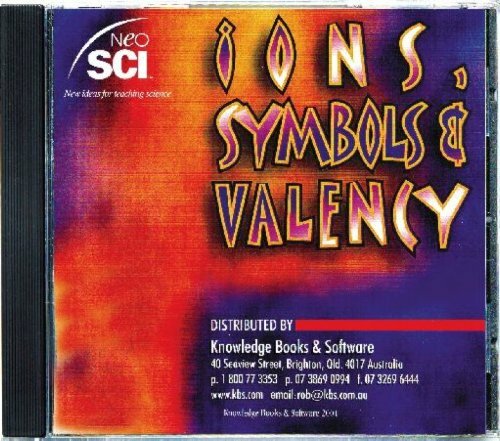 The Neo/SCI Ions, Symbols and Valency CD-ROM is computer-based exercises to create and identify various ions for students in grades 7-12, and includes a narrated tutorial and an illustrated glossary, interactive activities, and self-assessments of student comprehension. The comprehensive tutorial offers self-paced and individualized lessons. Topics include atomic structure, formation of ions, electron shells, stable octets, noble gases, charges, valency, common ions, polyatomic ions, and ionic equations. Activities include a crossword puzzle and an interactive game to learn the symbols of 40 common elements. Terms within the text are defined in an illustrated glossary. A self-assessment section evaluates student comprehension. Links to web sites provide students with additional resources. Science education products incorporate applied math and science principles into classroom and homeschool-based. Teachers in pre-K, elementary, and secondary classrooms use science education kits and products alongside science, technology, engineering, and math (STEM) curriculum to demonstrate STEM concepts and real-world applications through hands-on activities. Science education projects include a broad range of activities, such as practical experiments in engineering, aeronautics, robotics, energy, chemistry, physics, biology, and geology. School Specialty provides instructional materials and supplies under dozens of brands, among them Think Math, Delta Education, Frey Scientific, Childcraft, and School Smart. The company, founded in 1959, is headquartered in Greenville, WI.